This is a 7 day motorcycle tour that offers the beauty of Sicily and that of the Amalfi Coast in a week. To do this we make use of what we call floating hotels. These are the overnight ferries that run from Napoli to Palermo and back. They start at 8pm and land you at 7am on the other side. The ferries are more like cruise-ferries with proper cabins with en suite bathrooms. They are quite big ferries and offer both a la carte and self service restaurants. Day 1: We set off from Rome early on a Sunday morning whilst the eternal city is still sleeping or having its early cappuccino. We reach the Amalfi Coast mainly on the ancient Appian way. Lunch in the small fishing village of Sperlonga with fantastic buffalo mozzarella and Bassiano ham. Along our way we have the chance of visiting Pompei with a professional guide before ending the day at the beginning of the Amalfi Coast in Vico Equense with an incredible dinner with true Neapolitan delicious pizza by the meter!! Day 2: We ride through the magnificent Amalfi coast enjoying sites such as Positano, Amalfi and Ravello. We run the full length of this very famous road and in the late afternoon reach the harbor of Napoli to set sail toward Palermo in Sicily. Day 3: Once we land in Palermo at 7am we shall ride through this town with no traffic and head for the renowned Cathedral of Monreale just outside of Palermo, where we shall have a proper Sicilian breakfast and visit this incredible church. Once we are finished here we will ride along the SS118 all the way to Agrigento enjoying the Sicilian countryside. Once we reach Monreale we shall take a stop to another Sicilian wonder, the Valley of Temples. The visit with the evening sun is really amazing. Day 4: From Agrigento we set our first port of call at the truly amazing Villa Romana del Casale in Piazza Armerina. This ancient Roman villa was only discovered at the beginning of the 20th century and and until then it kept some of the most amazing floor mosaics intact. They have been fully restored and now you can view them from the top of a raised promenade. It is a truly amazing visit. After this visit we head for Siracusa on the SS124, a truly great road to ride across Sicily. We spend the night in heart of the old baroque city on the island of Ortigia. Day 5: We head out of Siracusa and ride the valley of the Anapo river to visit the Necropolis of Pantalica from here we head for the Etna volcano by passing Catania on the ring road. We then cirmcum ride the volcano on the east side riding incredible roads across recent lava fields in remarkably good condition. We reach Taormina in the late afternoon, giving us enough time to enjoy the evening stroll and aperitif before dinner. Day 6: We spend a few hours in Taormina to visit the Greek theater and then take the SS120, one of the best roads in Sicily across the Nebrodi and Madonie mountains. 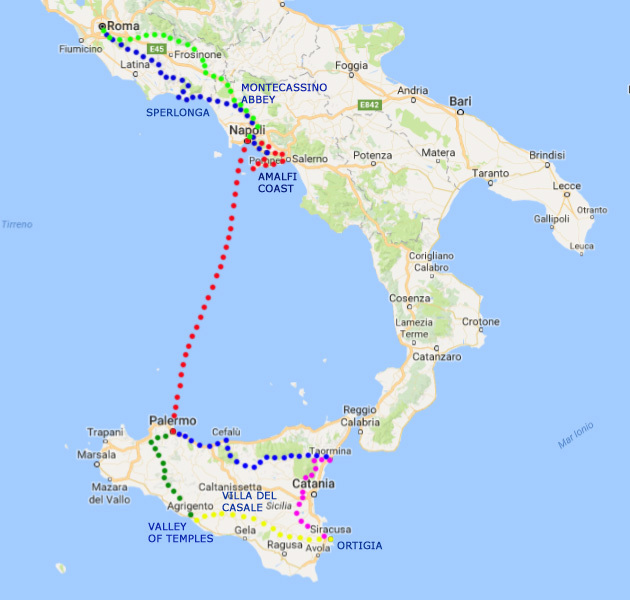 We reach Cefalu for a visit to the cathedral and then head into Palermo along the coast to reach our floating hotel which will take us back to Napoli overnight. Day 7: We get off the ferry at 7am and aim to get out of town as soon as possible. We shall take the autostrada until we reach Cassino from there we shall take the minor roads across the hills of Ciociaria and get back to Rome in the evening.